The RACT has consulted its members and key stakholders like Bicycle Network, as well as establishing an expert panel to provide advice on the strategy. The vision cites the importance of shifting 4% of commuter traffic out of cars and onto the alternatives of public transport, walking and cycling. “We believe this can be achieved by making public and active transport more affordable and attractive to use, as well as looking to shift land use planning towards more high density development along public and active transport corridors,” RACT Executive General Manager, Stacey Pennicott, said. 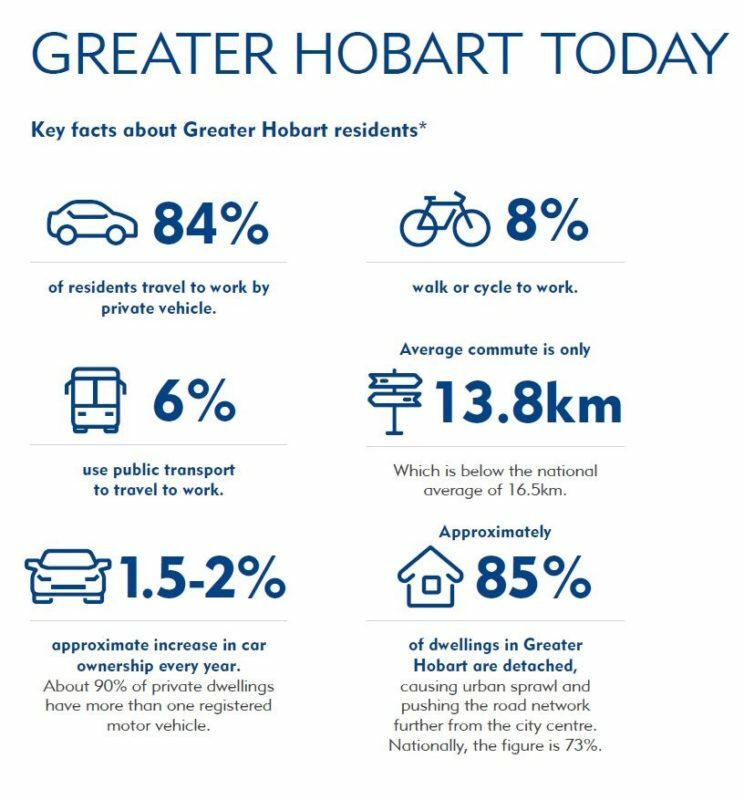 “Reducing the percentage of private vehicle use by 4% would make a significant difference to the efficiency of the road network at peak times and ensure Hobart was more in line with the majority of other capital cities,” she said. The vision supports separating cyclists and pedestrians from vehicles through cycleways and walkways and to remove or significantly reduce the number of vehicles in the Hobart CBD. • Deliver infrastructure projects that reduce interaction between people and vehicles in the CBD (eg. shared spaces similar to Liverpool St). • Remove on-street parking in key locations to facilitate prioritisation measures for public transport (eg. Main Rd/Elizabeth St, Sandy Bay Rd), as well as separated cycleways. • Commence work on active transport spines in the CBD in each direction, including from the Rivulet Track to Intercity Cycleway, Elizabeth St south and north bound and from Sandy Bay to CBD. The vision also encourages better integration of active and public transport, including that a ferry service visiting at least three terminals be designed to carry bicycles. In years 11–20 the vision recommends retrofitting roads to link in with the three main active transport corridors, as well as expanding the number of ferry terminals to eight and ensuring they ware connected to cycleways and footpaths. Disappointingly, the vision calls for the retrofit of the Tasman Bridge to support more road users by dedicating existing space to shared and active options, but not until years 21–30 of the plan. We know retrofitting the bridge would help people living on the eastern shore to easily commute via bike or foot and it should be done as soon as possible. While a ferry service that carries bicycles would be a welcome addition to our transport choices, people walking and riding should be able to comfortably use the main bridge between the two sides of the River Derwent. The RACT says it will lobby political parties during the federal election campaign to make commitments to its $335 million plan.